Declutter your kitchen before placing your house on the real estate market to sell your home fast and for more money! Would you buy this house after seeing this kitchen? Declutter your kitchen to improve your chance of a quicker sale. 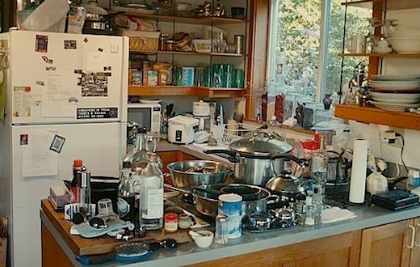 The kitchen is the most important room in the house for most people. Buyers may rave about the rest of your house, but if the kitchen doesn’t meet their expectations, they may walk away. Some Realtors say that you are selling your kitchen, not your home! House hunters are looking for spacious countertops, a good work triangle, updated appliances and plenty of storage space. Buyers are very savvy these days, knowing the costs of updating or remodeling a kitchen, and most will not want to take on this job when buying a new home. If your kitchen needs more than a little updating, a simple renovation could be the answer. Kitchens and bathrooms are two areas where a renovation can give you a big return on your investment when selling your home. If you're worried about a small kitchen and how it will present itself to buyers, see small kitchen decorating ideas for home staging tips on making tiny spaces appear more spacious. This unfinished and cluttered kitchen is almost there! It simply needs matching appliances, window trim and new flooring. A classic subway tile backsplash would send this kitchen over the edge. Unfinished projects, as featured in the photo above, are a real buyer turnoff. Most house hunters won't want to take on someone else's incomplete work. BEFORE YOU DECLUTTER YOUR KITCHEN: Collect boxes, totes, garbage bags, bubble wrap, tape and permanent markers. Label your boxes and bags appropriately; donations, move, throwaway or yard sale. To make the job more palatable, divide this chore into two days. Do the upper cabinets the first day, the lower cabinets the second. For instructions on how to clean your type of cabinets, see cleaning your kitchen cabinets. Clean clutter inside cabinets too! Declutter your kitchen first by clearing off the countertops. 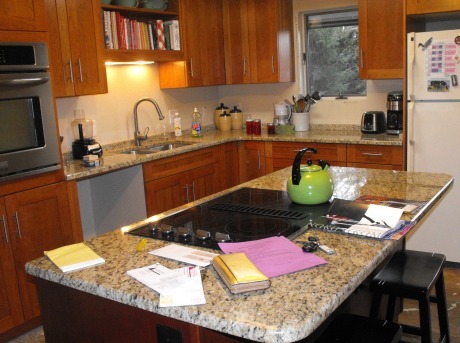 Cluttered countertops give the impression that you lack storage space and need the countertops for overflow. Cluttered countertops can also make a kitchen appear tired and small. 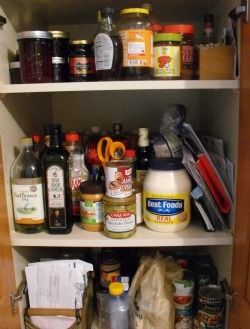 Don’t forget the inside of your cupboards. Buyers WILL look inside to see if there’s enough room for their things. Buyers will think your kitchen lacks storage space when cupboards and drawers are crammed full. Illusion plays a key role in the art of home staging. Leaving spaces around items will give the impression that there's lots of storage room in your kitchen. This is your chance to get rid of rarely used items. Donate appliances you never use and pack up grandma’s punch bowl that you drag out once a year. When staging the kitchen, put only 1/3 to half of the items back into the cupboards. Leaving spaces between items will give the illusion that there's plenty of room inside the kitchen cabinets and drawers. As you declutter your kitchen cabinets, you'll notice things that don't belong in that part of the kitchen. Put these items aside for the appropriate cabinet later. Organize your cupboards by grouping similar things together; canned items, plastic food containers, pots and pans and so on. If you have an excessive amount of plates, glasses, mugs, etc., box most of them up. Be aware of your work triangle and store the appropriate items nearest to where you use them; pots and pans near the stove, for example. As you declutter your kitchen, organize the cabinets with similar items, and be sure to “face” each item toward the front. This is a grocery store trick to keep shelves looking neat and organized. Leave plenty of open spaces in your cabinets to show off all the new storage space. You can find a great selection of kitchen organizers for cabinets and drawers at any home center these days. 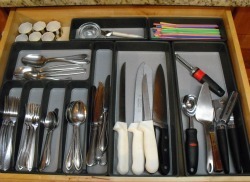 For messy utensil or “junk” drawers, use inexpensive trays and boxes to keep things neat. Buyers are always impressed when they open a neatly organized drawer. Declutter your kitchen with organizer shelving for stacking dishes and bowls. I particularly like the drawer organizer in the picture on the right-- I use it in my own kitchen. It has rubber feet on the bottom that prevents annoying sliding when you open the drawer. You can find this product and others like it at www.madesamart.com. Dingy kitchen cabinets can be spruced up with a good cleaning, a coat of paint or refacing. If your kitchen cabinet doors are in bad shape or outdated, consider replacing the door panels. It's easier and less expensive than replacing the entire cabinets. With refacing, the boxes and frames of your existing cabinets are kept intact. You can buy doors already finished or refinish your own. DON'T reface the cabinets if the frames are in bad shape, though. Painting kitchen cabinets and walls a light neutral color can create the illusion of more space in a small kitchen. A fresh coat of paint is often the remedy for reviving tired and dingy kitchen cabinets. This job is not for the faint of heart, though! You must remove all the cabinet doors and hardware, sand, prime, dust, paint, sand again then paint your final coat. Below is a great video showing you how to paint your kitchen cabinets the right way. Video by Jennifer Stagg. Avoid "taste specific" paint color schemes like purple or neon lime green. Stay away from trendy styles and embellishments, like stenciling or glazing. Browse through home decor magazines or go online to view kitchen cabinet colors for ideas. Adding new cabinet and drawer hardware is a quick and affordable way to update your kitchen. You may need to fill the old hardware holes before you paint if they don't correspond with the new ones. To avoid this problem, take the old hardware to the store with you and select new ones with matching holes. When choosing knobs and pulls for your cabinets, stick to neutrals like polished nickel, satin and brushed finishes. Avoid brassy tones or cutesy hardware that may only appeal to you. Watch the video below by alchemyfineliving to learn how to fill hardware holes. Home buyers have become very demanding about their kitchen countertop preferences these days, preferring granite, marble or quartz over less expensive options. If your kitchen countertops are in dire need of replacement, consider a precut slab of granite, Silestone or CaesarStone. These products are available at much lower cost at Home Depot, Lowe’s, and other home improvement stores. Most home improvement stores provide installation services, or instructions on how to do-it-yourself. For more information on affordable kitchen countertops, go to www.homedepot.com or www.lowes.com . For a high-end look without the maintenance of marble, try engineered quartz countertops. They look beautiful and the surface is nonporous and durable. A pretty backsplash is like the accessories on a women's outfit. 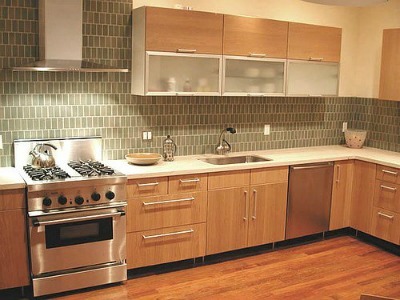 This green tiled backsplash is the jewelry in this kitchen! I always think a kitchen looks incomplete without a backsplash, in the same way that a woman's outfit needs accessories to complete it. Adding a backsplash will add color and texture to a kitchen and make clean up easier. A kitchen backsplash doesn't have to be fancy. Affordable and classic subway tile will enhance any kitchen decor. Adding new and MATCHING kitchen appliances will bring a higher return for sellers, so get rid of old ones that make your kitchen look dated and tired. They don't have to be expensive, just clean and matching. Home buyers will appreciate that. If you can't afford to replace outdated kitchen appliances, try re-facing the fronts with an affordable sheet of stainless-steel film. EZ Instant Makeover offers a high quality vinyl film that will stick to the surface of any smooth-faced appliance you wish to update. In addition to kitchen appliances, you can also use this stainless-steel film on any flat surface, like counter tops, backsplashes and shelves. This product is scratch and heat resistant and easy to clean. For instructions on cleaning stubborn stains and making your type of kitchen sink look great, see cleaning your kitchen sink. See cleaning grout for tips to refresh the look of your kitchen tiles. Sparkling kitchen tiles will help sell your house fast and keep home buyers from negotiating the price down. If kitchen grout is in need of replacing, watch the instructive video below for help in removing and replacing grout. Video by essortment. Declutter your kitchen by cleaning out the fridge. People WILL look inside the fridge to check out the space, so it’s vital that it looks spacious and clean. When you've finished decluttering and cleaning your kitchen, it's time to move on to the FUN part of the home staging process, where you get to apply home decorating ideas to the space. See staging the kitchen for home staging tips.